Sometimes when I’m creating recipes they evolve as they go along; these cookies began life with every intention of coming out looking like Jammy Dodgers (one of my fave childhood biscuits) but as you can see they didn’t quite get there. Well the first batch did – I spent ages painstakingly shaping them and cutting out hearts in the middle with tiny cookie cutters and I’ll be the first to admit that for all the faff they did look fab, but boy did they take forever. And that’s not what we’re about here at D&H; gourmet pastry chefs we certainly are not. We like easy, quick and simple recipes that taste delicious and don’t contain millions of ingredients. 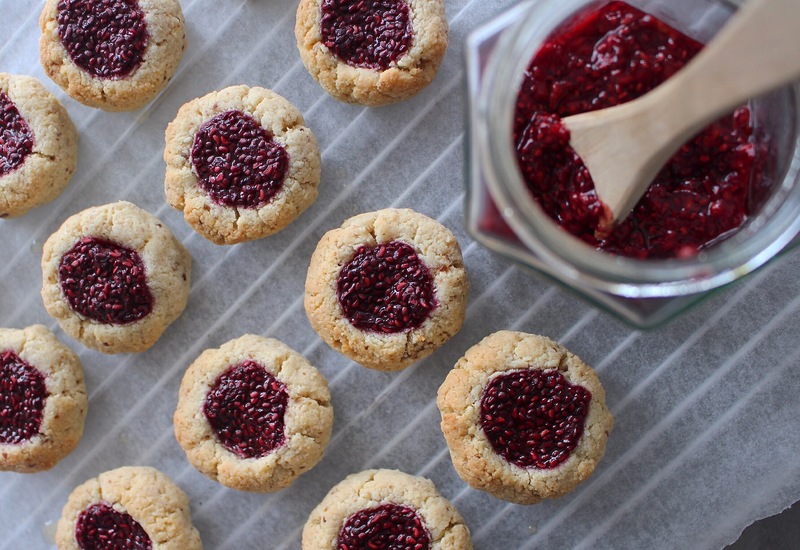 The beauty of these biccies is that you can make the jam in advance (which in itself only takes 10 minutes) and pop it in the fridge or freezer, then when you’re ready to get baking you just need to grab the jam and the 5 ingredients needed for the cookies and you’re all good to get baking! And all you need is a mixing bowl and an oven so it’s definitely minimal on the clearing up side too, which is always a win. 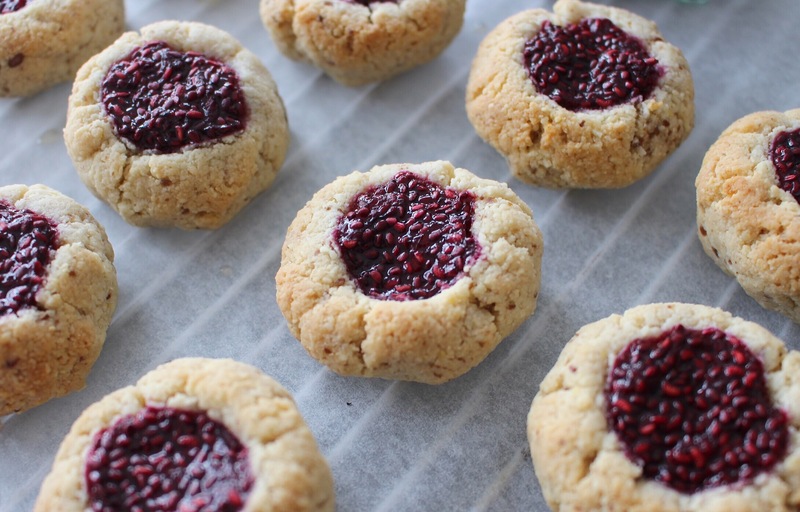 It’s a great recipe to make with kids too and the cookies are great for little ones as there’s no refined sugar involved (just a bit of maple syrup) so they won’t be bouncing off the walls with a sugar high! Because they’re so quick they’re a great little Sunday evening bake (as a week ahead without snacks is just not even worth thinking about) and they’re fab for popping into a tupperware and taking into work (a la Mr H) to have with a nice mid-afternoon cuppa. Make the jam in advance (if you’ve made it on a previous day just take it out the fridge or freezer and if you’re making it on the same day just allow it to cool a bit while you make the cookie dough). For the cookie dough, simple combine the ingredients in a mixing bowl and stir until everything is mixed together well. Shape the mixture into small balls (slightly smaller than a ping pong ball) and flatten them a little with your hands. Poke your thumb into the middle to make a nice indent for the jam (remember, the bigger the hole the more jam you can stuff in so get poking!) and pop them on a baking tray. Spoon the jam into the centres with a teaspoon and bake at 180C for 15 minutes until they are golden on top but still slightly soft as they will harden while they cool. Leave them to cool for 15 minutes or so then (if you have better self control than me) store them in an airtight container in a cool, dry place. Or if you are like me, boil the kettle and enjoy half the batch with a nice cup of herbal tea. Perfection!